After a tough few years, Tucson’s luxury housing market is on the rebound. For the first half of this year, sales of homes priced $800,000-plus were up 7 percent compared to the same period in 2014. At the same time, the number of unsold luxury homes languishing on the market was down 6 percent from last year — and down 19 percent from January. 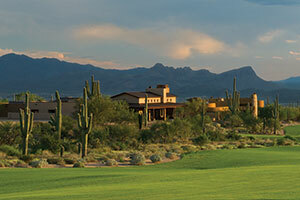 The Residences at The Ritz-Carlton, Dove Mountain has sold nine properties totaling $18 million so far this year. Each one sold for $1 million to $3.4 million. “With another couple of sales by year’s end, it will be our best year ever,” said Rich Oosterhuis, director of sales and marketing for Dove Mountain Realty LLC. Things are going so well that the company is building spec homes that will be available this fall. The rebound in luxury sales is due to several factors: “an improvement in consumer confidence and the economy, growth in housing overall and the fact that affluent buyers are watching the Tucson market,” Long Realty CEO Rosey Koberlein and vice president of marketing and technology Kevin Kaplan said in a joint email. Because luxury markets in Phoenix and Scottsdale are well into recovery, buyers find Tucson prices more attractive, they said. “There is still a sensitivity here to pricing in the luxury segment,” Koberlein and Kaplan said. The overall housing market continues a steady improvement with median home prices up 16 percent since 2011, data from the Tucson Association of Realtor shows. Traditionally, the luxury market has been concentrated in the Foothills, but now about one-third of those sales are on the northwest side, such as the Residences at The Ritz. Since opening for sales in 2009, the development has sold 40 homes for $70 million. In addition to custom homesites, buyers can choose from eight customizable floor plans. Among the amenities, residents have access to The Ritz-Carlton Dove Mountain resort, which earlier this year received a five-star rating from Forbes Travel Guide. Buyers are a mix of people, Oosterhuis said. In 2010, Google executive Ray Sidney poured an undisclosed amount of cash into The Residences at The Ritz-Carlton to clear the developer’s debt. Local developer David Mehl said Sidney’s investment was crucial to moving the project forward at a time when many projects were stalled because of the housing downturn. The community is in the Tortolita Mountain Foothills, and a full resort membership is included with each home purchase. That gives residents access to the Ritz-Carlton hotel and spa, a 45,000 square-foot clubhouse, 27 holes of Jack Nicklaus Signature Golf, an Olympic-size swimming pool and more than 25 miles of hiking, biking and horseback riding trails.